The map above shows the most interesting fact about Kiribati: It’s the only nation in all 4 hemispheres of the world (North, South, East and West). 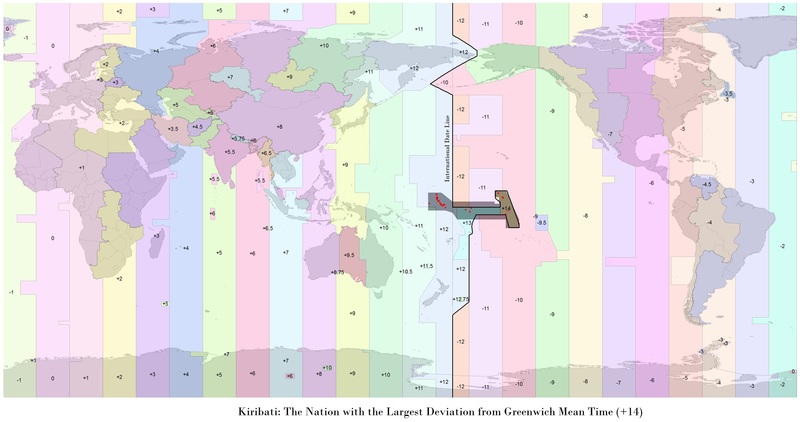 The country is also the furthest ahead of Greenwich meantime at GMT +14, making it the first country in the world to ring-in the New Year. This was done to keep the working week the same for entire country and not have it split over the international date line. While the country’s land area is a mere 811 km2 (313 sq mi) it has an Exclusive Economic Zone (EEZ) of 3,441,810 km2 (1,328,890 sq mi) making it 4,243X larger! 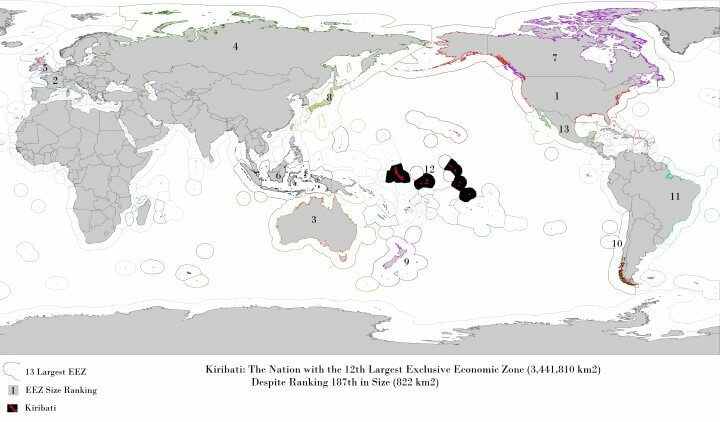 Thus, while the country is only the 187th largest in the world, its EEZ is slightly larger than all of India! Located in the central Pacific Ocean, Kiribati is made up of 33 atolls and reef islands, only 21 of which are inhabited. It has only 103,500 people making it the 197th most populous country on earth. Over 90% of the population lives on the Gilbert Islands, with nearly 50% living on Tarawa. The country includes Christmas Island which is written as Kiritimati in the Kiribati language but pronounced the same as Christmas. 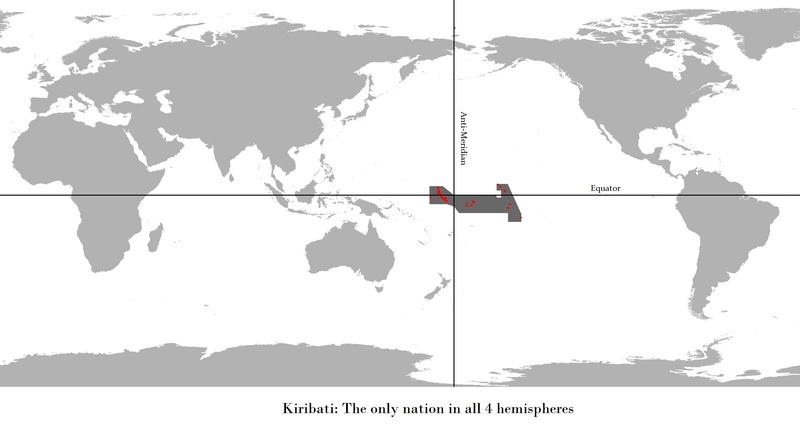 Kiritimati is the largest coral atoll in the world and makes up about half of Kiribati’s land area. Tarawa Atoll and others Gilbert islands were invaded by the Japanese in December 1941 and liberated by the Americans 2 years later in November 1943 in the Battle of Tarawa. The country only gained its full independence from the United Kingdom on July 12th, 1979. Most of the islands and atolls are only 1-2 meters (3-6 feet) above sea level, with the highest point just 81 m; (266 ft) above sea level. Two small uninhabited islets, Tebua Tarawa and Abanuea, disappeared below the sea in 1999. To counter the very real risk of the entire country disappearing beneath the waves within the next 50 years, Kiribati is in talks to buy 5,000 acres from Fiji where they can start relocating people. So you might want to book a hotel and visit Kiribati soon, before it disappears forever. Great discussion, but PLEASE fix all those many wrong instances of “it’s” by changing them to “its”. My inner Grammar Nazi is about to have a coronary.